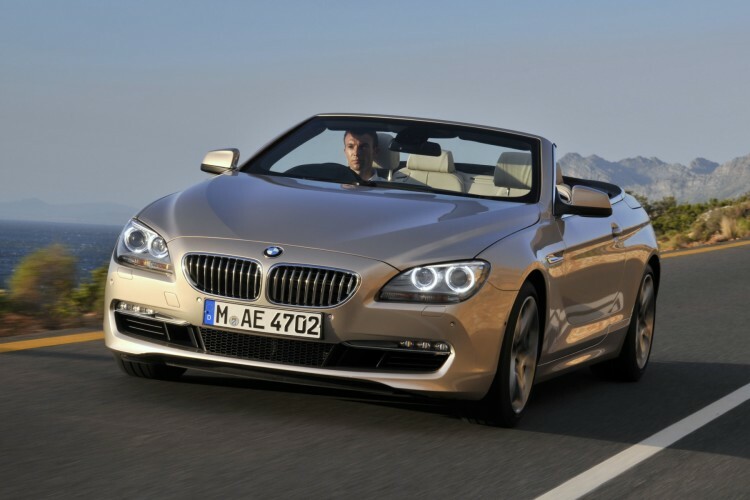 The base price of the new 2012 BMW 650i Convertible was announced at the 2011 Detroit Motor Show and beginning this spring, BMW customers looking for a high-end BMW convertible will have to shell out $90,500. This week, BMW releases more information around packages and options pricing. In standard configuration, the 4.4 liter twin-turbo charged V-8 engine producing 400 hp and 450 lbs-ft of torque is matted to a 6-speed manual transmission. An 8-speed sport automatic transmission is available also. There are four packages offered with the 2012 BMW 650i Convertible. First, the Cold Weather Package with a price of $750 which includes ski bag, heated front seats and steering wheel. Next, Luxury Seating Package, $1,500 and ads active and ventilated front seats. A $3,900 Driver Assistance Package includes Parking assistant, Head Up, Surround view camera, Automatic high beams, Lane departure warning, Active blind spot detection. Last, Premium Sound Package – $1,800 (Premium hi-fi, Satellite Radio, USB). The vehicle will start production in March 2011 and launch in May.